Note: On the Pull-up Test, there is no time limit. Palms must face away from the body. One hand may release from the bar, but the feet may not touch the ground. Prescribed weight for men on the Bench Press is up to 135lb. and up to 85lb. for women. However, you must use a weight you can perform at least 15 consecutive repetitions with. No more than 4 minutes rest between rounds. Who can complete each individually timed round in under three minutes? Compare todays effort to April 14, 2014 and May 28, 2014. Team Fontes – A Family of Champions! On Friday, July 4, 2014, our gym was blessed with the attendance of the entire Fontes family. 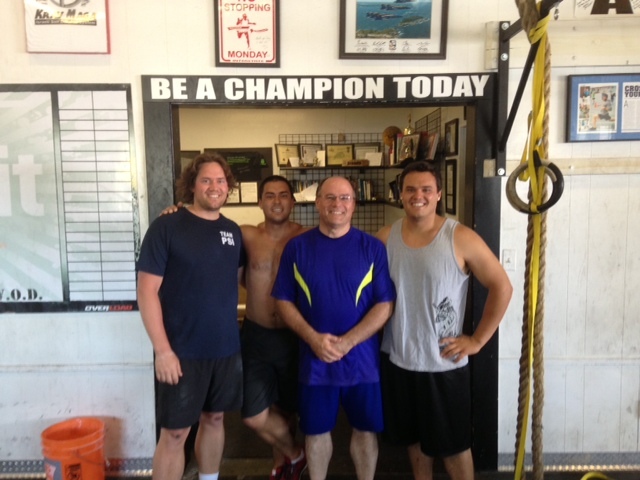 Cole and Wade are two of our regular Champion Firebreathers, and their progress in the gym has been inspiring. Their older brother Heath and father Murray, also two solid Athletes, jumped into the challenging workout on Friday to pay their farewell respects to Aaron and Graham. The Fontes family is well known in Santa Cruz County for their leadership, fitness, friendship and service. We love you guys!